As said earlier in my preview of what’s to come in 2015, regarding the visual arts in the Metro, the most anticipated event continues to be the midsummer opening of the newly renovated 1516 Gallery on Leavenworth which just happens to be the venue’s street address. Although 1516 will not likely be a full service gallery in the manner of Modern Arts Midtown, Gallery 72 or Anderson O’Brien, it will add some much needed additional 6600 sq. ft. of viewing space to the local arts scene with a unique mission of its own. Founder Patrick Drickey says his venue will specialize in local and regional artists along with travelling exhibits from the Museum of Nebraska Art in Kearney and the Bone Creek Museum of Agrarian Art in David City. Gallery 1516’s inaugural exhibit can only be considered blockbuster. Meanwhile work continues at the gallery, including the installation of a new window that will allow a spectacular view of the Omaha skyline, but Drickey is especially pleased with a recent addition, gifted through the combined generosity of Jun and Ree Kaneko and Olson/Kundig, Seattle architects. When the gallery is fully operational, 1516 will be staffed by a full time director and two to six part-timers “depending on availability and demand.” Drickey is also counting on volunteers, and given the popularity of recent events held there to promote the new gallery and its mission, there should be no shortage of interest in welcoming another opportunity to view and support contemporary art in the Metro. 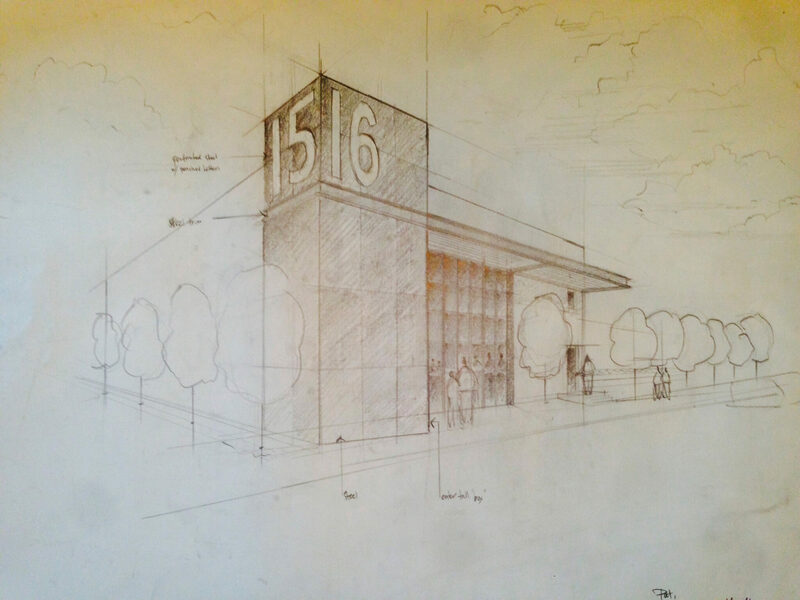 A full time director and more means that unlike in the past, 1516 will be open to the public with regular hours, Tue-Fri, from 10 a.m. to 5 p.m., Sat from noon to 8 and Sunday from noon to 5. New exhibits will open on Thursday evenings and, depending on the show, will be up two to three months, including two-month exhibitions from MONA in Spring and Fall. As for the Guesthouse next door at 1510, Drickey said it will offered to speakers and artists who “come to Omaha for single or double night speaking engagements, etc. It takes a local sponsor…we only offer the space to no-profit art related groups, such as MONA or the Kaneko, to get access. If architectural renderings as well as recent memories of said table at the Kaneko exhibition mentioned above are any indication, viewers may very well be blown away also when Gallery 1516 opens its doors…as well as grateful that along with Benson, Vinton Street, the Old Market, and Midtown Crossing another familiar corridor along Leavenworth will once again be open to foot traffic in search of Nebraska visual art.